This fairly decent high-sun display was captured while I was on lunch break. 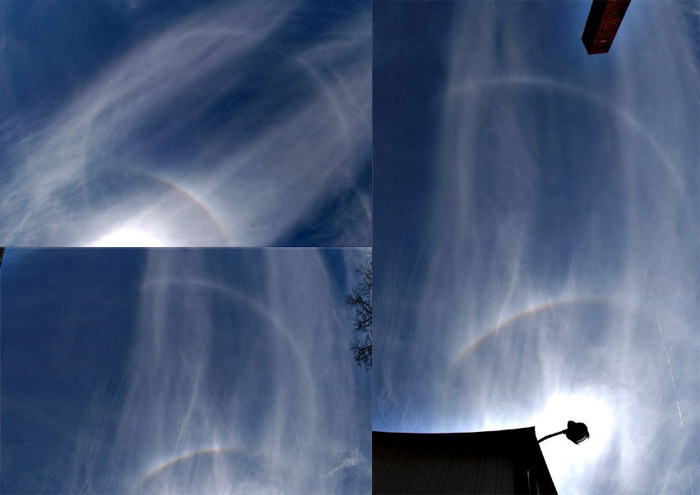 Although there were no rare halos but there was 22d halo, circumscribed halo, smooth complete parhelic circle, and faint circumhorizon arc. The best part in my opinion was the parhelic circle. I have applied unsharp mask to bring the halos out better. Photos were taken on the 11th. Michael, where did you make the pictures? If it's somewhere on the northern hemisphere, the location has to be South of 40 deg. North, on April 11th, because the circumhorizon arc requires at least 59 deg. solar elevation. I made them in Southern Ohio USA. I heard about odd radius display you got in 1973 do you have pics? Wow Frank you must be lucky you got those halos. This year I got to see rare wegener and heliac arcs on January. in 2005 I got to photograph my first elliptical halo and I found out it was the first since 1987 then in Decemeber I get another elliptical halo. Have you been to my site: If not email me at bowlturner@yahoo.com and I will mail the link to my site. If you like tornadoes like me then you will like my tornado generator.